Count the birds in your yard or park for an hour for the Big Garden Birdwatch. Walk London's Walk Out to Winter weekend offers free led walks all over town. Visit the Southbank Centre's Festival for the Living all about Death (free and ££ activities). Watch the new Muppet movie and more at the London Comedy Film Festival at BFI. The Telegraph Adventure Travel Show is at Olympia (£8). Like street art? Tour the Stik Map. Hungry? Here's where to find London's best Japanese food. The Fabelist Imprint Festival sounds artily intriguing, with a daytime, kid-friendly launch event at the Serpentine Centre for Possible Studies, Gloucester Place, W1 from midday till 8.30pm (free). It's the last weekend of Mime London - try Sugar Beast Circus at Jackson's Lane, 8pm (£14.95). It's Last Friday for the South London Art Map. Take an art tour, visit new galleries and enjoy the after parties from 6-8pm and beyond (free/pay what you can). Help cook and eat a Burns Night lunch in Myatts Field Park from 10.30am-1pm (free). The Swedenborg Birthday Lecture is about Swedenborg's philosophy and love, followed by music and refreshments. At the Swedenborg Society building in Bloomsbury from 4.30pm (free but limited capacity). Show London Fields Lido some love at its annual arty evening event from 7-9pm (£15). Go dancing at Scared To Dance at Kings Cross Social Club, 9pm-2am (£3/5). There's an Electronic Late at Barbican till 10pm (free). There's live music, Djing and tasty food at Tooting Market with Nights at the Market from 8.45pm (£3 adv, £5 on door). The King's Army Annual Whitehall Parade marches from St James' Palace to Whitehall from 11am, commemorating the execution of King Charles 1. The Snapshots Festival celebrates East London Jewish Culture: Bagels, Bar Mitzvah and Babkas at Rich Mix from midday till midnight (free). 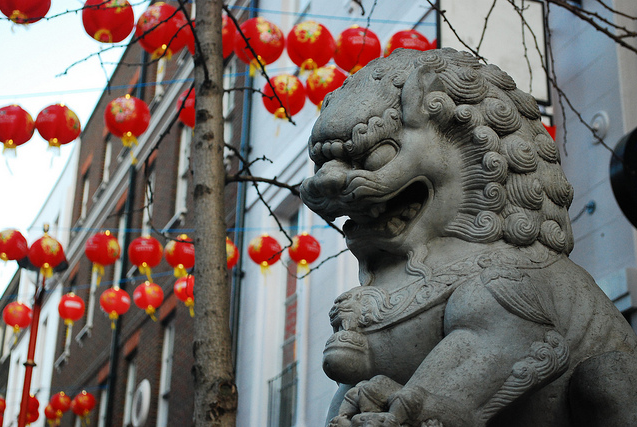 Welcome the Year of the Dragon in Trafalgar Square and Chinatown, with Chinese New Year celebrations from midday (free). Anita's Vintage Fair is in Notting Hill from 11am-5pm (£2/1 entry). Explore the new home of the Wiener Library on Russell Square from 12-4pm (free). Photo by shuma.rani via the Londonist Flickrpool.